Image courtesy of Jacy Schindel, CBC Vancouver. I had the pleasure of doing a walk-around with Deborah Gobel (reporter) and Jacy Schindel (camera operator) from CBC TV Vancouver this past Saturday. 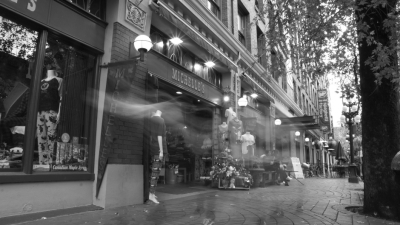 We visited some of my favourite haunted locations in Gastown – Waterfront Station, Lamplighter Pub, Gaoler’s Mews and the Old Spaghetti Factory. The segment aired on the CBC Vancouver news program that night. Jacy also put together an excellent photo essay on the CBC news website. Thanks for your observations. The ghost walk I did with CBC TV Vancouver in October 2016 was a one-off, just for television. I don’t otherwise advertise or provide guided ghost walks. Some of the locations featured on ghostsofvancouver.com are accessible to the public, as they are restaurants, hotels and so forth. But, as you’ve correctly pointed out, many should not be entered as it would disturb the occupants. And, of course, others are strictly off limits to the public. And while it’s unlikely that you’ll encounter a ghost outside of a haunted location, it’s not an impossibility. At the very least, the historical buildings are interesting to see as you walk around haunted Vancouver. The ghost walks advertised cannot enter these buildings as they will disturb commerce. You would think walking the area would not generate as much contact!